The last decade or so has seen the resurgence of the city. In many metro areas it is not uncommon to see the central city growing faster than the surrounding suburbs in recent years. There has been renewed interest in urban living, especially among younger generations. Central cities across the country have tried to tap into this interest by investing in their urban cores in order to provide lifestyle and housing choices that are increasingly desirable. Locally, downtown Kansas City, Missouri, has seen its population grow 48 percent since 2000 (13,485 in 2000 to 20,000 today). 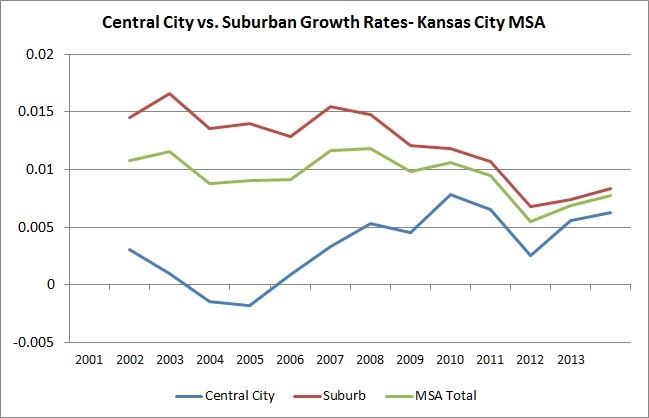 In Kansas City, the suburbs have consistently grown faster than the central cities (Kansas City, Mo. and Kansas City, Kan.) but the rate of growth is narrowing as the chart below shows. Here are a few key points from this chart. The overall growth rate of the metro (green line) has slowed between 2009 and 2011, likely due to our lackluster recovery from the recession. More recent years show the rate increasing, but it is not yet back to long-term growth rates of about 1 percent a year. Central city growth was negative in the early 2000s but has risen to be more in line with suburban growth rates since 2009. Kansas City’s suburbs have consistently seen the most rapid growth, but that rate has slowed considerably. There is one other key point to note. Our central cities (the two Kansas Citys) are not like your typical central city. While they encompass the central business district and much of the region’s oldest housing, they both also have a lot of areas that look very “suburban” and a great deal of their recent growth is due to this type of development. This fact, coupled with the renewed interest in more urban-style housing, has led to a more balanced growth pattern for our region. It will be interesting to see if this more balanced approach persists as the region resumes its usual growth rates. The data for the chart is available here.